He was the assistant priest. He told me wanted to to leave the priesthood. That he wanted a family. I didn’t think priests could or should leave. As our friendship developed, I was on a mission to convince him not to leave. On the day he announced to the parish that this would be his last mass, I felt I’d failed. We went out for dinner. He told me I hadn’t failed. He asked me to marry him. It was 1966, and interracial marriage, while legal in Michigan was frowned upon. We had much to overcome. Our families: my mother was convinced I was throwing away my life; his family was furious that he’d left the priesthood. Our jobs: he was earning $50/week delivering flowers; I was working at the bank downtown. Our future: he needed to find a career suitable for a former priest; I needed to get back to college ASAP and get on a career path that would make me the primary breadwinner. The fact: he would be retiring when it was time for the girls to go to college. The urgency: I didn’t have time for all the drama of our age and race difference — I had a family to take care of and I had to figure out how — fast! I wrote the whole story. After I retired from 21 years as a judge on Detroit’s 36th District Court, I decided to write my memoir. I was adopted before I was six months old, having been given up by my white birth mother because my father was black. Her family did not want any mixed babies in the house! This was 1946. My adoptive parents, a black couple, had the best intentions, but my adoptive mother was abusive. They also adopted a son who was older than me. He left home at 16 when he could no longer endure our mother’s abuse. Our father, a loving man to us, did not intervene. My high school boyfriend was also abusive. When I met Father Atkins and began developing a friendship with him, I was instantly drawn to his peaceful, gentle nature. The unpredictable cruelty I’d endured from my mother’s wrath melted away when I was with him. When he proposed, I considered what a life with this gentle soul might look like in spite of the odds against us with our vast age and cultural differences. Deciding to marry him was easy. I never looked back. My birth name was Rosemary. 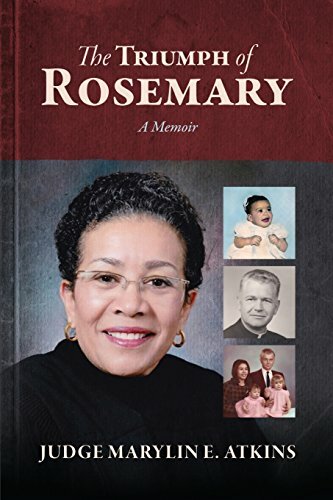 I chose to call my book The Triumph of Rosemary because it was that little biracial baby, Rosemary, who had hurdles to clear and hills to climb to get beyond her circumstances to something better than anyone could have imagined for her. Mine is a story of triumph and teamwork. And family. Click here to read reviews and more about my book. My alma mater, Saginaw Valley State University, invited me to give the Commencement address in 2018. Considering my circumstances as I earned my bachelor’s degree in Psychology back then, the honor of having the chance to inspire the graduates was beyond words. Here is a link to my 10-minute speech. If you’d like to send Marylin a note or invite her to be on your podcast, please contact her here. To request a review copy, please contact us using the form above. Thank you.